This last (possibly last) post by me extends the discussion of future effects of increased CO2 out into the next 8 millennia – roughly the same period of time over which man has developed advanced civilizations after the last glacial period which ended about 12 millennia ago. The essence of these predicted effects are described by the Figure 1 shown below. Figure 1. How cumulative carbon emissions are expected to set the climate thermostat for the next 8 millennia. These predictions are based on recent calculations by Eby et at. reported in the AMS’s Journal of Climate (abstract can be seen here) using the UVIC coupled carbon/climate model. The numbers on each curve gives the total cumulative carbon emissions (in gigatons) over the time while human activities continue to emit carbon dioxide. The results described here tell us nothing that I have not emphasized before. I am sharing them with you here, because they more quantitatively and more clearly express our planet’s expected future after the Age of Fossil Fuels. Note in Figure 1 that it matters little to long-range temperatures whether all the CO2 is emitted in one enormous burst at the very beginning of the fossil fuel era, or if it is instead spread out over several centuries. It is only the cumulative amount of CO2 emitted that matters. A cumulative emission of one trillion tons of carbon just might keep the Earth below a warming of 2 degrees C, a commonly accepted goal in the fight against climate change (see Figure 12 of Post 7). The extent of warming at any point over this vast time scale increases linearly with cumulative emissions. Note also that the warming you get at the peak is pretty nearly the warming you are stuck with for the next millennium, with only slight declines after that. We are currently about half of the way towards our first trillion tons of accumulative carbon emissions. Given the nature of exponential growth, we will be getting to the one trillion ton point pretty quickly if nothing changes. If you go beyond and add 2355 gigatons of carbon into the atmosphere before stopping all emissions from fossil fuels, then the global mean temperature will still be 3 degrees C warmer than pre-industrial in the year 8000. That would give ample time for all kinds of undesirable amplifying feedbacks to occur, including the deglaciation of Greenland, the loss of the West Antarctic Ice Sheet, and/or PETM-type carbon releases from the ocean bottoms via the melting of methane clathrates. Note further that these calculations were done with a model designed to have a climate sensitivity similar to the IPCC median (of about 3 degrees C). Therefore, even if you hold the line at one trillion tons, there is still about a 50% chance that warming will be greater than 2 degrees C.
The predictions reported in Figure 1 are not the fantasies of a few kooks working in isolation. Note that its half dozen coauthors are accomplished scientists working in top universities of the US and Canada. Given the journal this article appeared in, it is sure to have been carefully reviewed by several experts in the field of climate change. 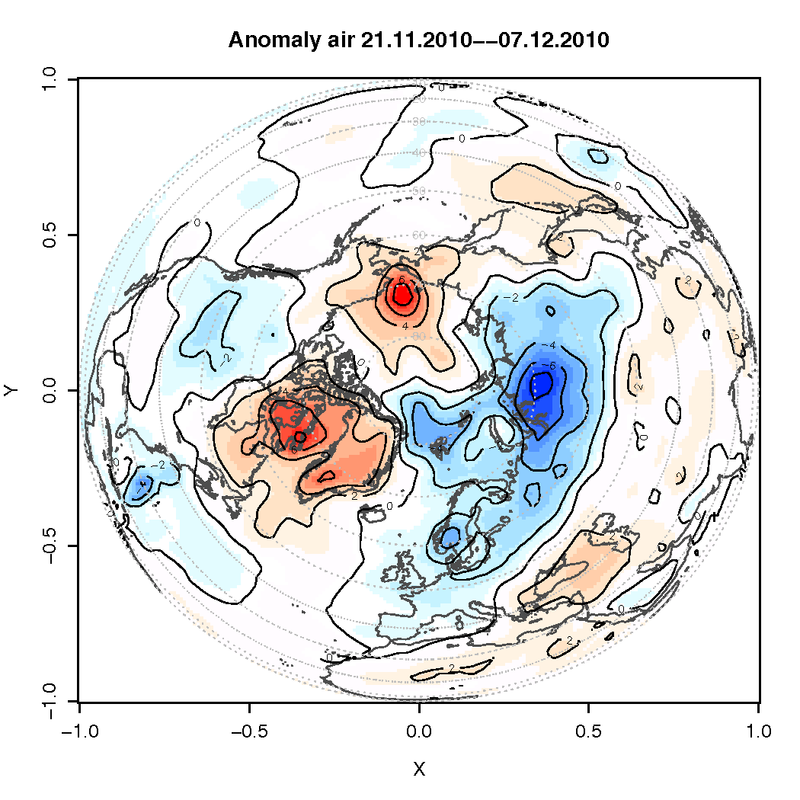 It’s results have not been seriously challenged, to date, and its basic message is entirely consistent with the common sense expectations for prolonged presence of the EXTRA CO2 in the atmosphere, which I have discussed extensively on the web site. Anyone that is projecting this far into the future is either on hallucinatory drugs or is mentally ill. In the case of James Hansen I'd think he is mentally ill-Bipolar manic depressed. One wonders if the current “scientists at NASA have bothered to read the 40 year old information from NASA found by Siddons and reported by O'Sullivan shown on G-2; 47. According to scientists' models of Earth's orbit and orientation toward the Sun indicate that our world should be just beginning to enter a new period of cooling — perhaps the next ice age. Other important forcings of Earth's climate system include such "variables" as clouds, airborne particulate matter, and surface brightness. Each of these varying features of Earth's environment has the capacity to exceed the warming influence of greenhouse gases and cause our world to cool. The Sun is the primary forcing of Earth's climate system. Sunlight warms our world. Sunlight drives atmospheric and oceanic circulation patterns. Sunlight powers the process of photosynthesis that plants need to grow. Sunlight causes convection which carries warmth and water vapor up into the sky where clouds form and bring rain. In short, the Sun drives almost every aspect of our world's climate system and makes possible life as we know it. Earth's orbit around and orientation toward the Sun change over spans of many thousands of years. In turn, these changing "orbital mechanics" force climate to change because they change where and how much sunlight reaches Earth. (Please see for more details.) Thus, changing Earth's exposure to sunlight forces climate to change. According to scientists' models of Earth's orbit and orientation toward the Sun indicate that our world should be just beginning to enter a new period of cooling — perhaps the next ice age. Other important forcings of Earth's climate system include such "variables" as clouds, airborne particulate matter, and surface brightness. Each of these varying features of Earth's environment has the capacity to exceed the warming influence of greenhouse gases and cause our world to cool. For example, increased cloudiness would give more shade to the surface while reflecting more sunlight back to space. Increased airborne particles (or "aerosols") would scatter and reflect more sunlight back to space, thereby cooling the surface. Major volcanic eruptions (such as that of Mt. Pinatubo in 1992) can inject so much aerosol into the atmosphere that, as it spreads around the globe, it reduces sunlight and cause Earth to cool. Likewise, increasing the surface area of highly reflective surface types, such as ice sheets, reflects greater amounts of sunlight back to space and causes Earth to cool. Scientists are using NASA satellites to monitor all of the aforementioned forcings of Earth's climate system to better understand how they are changing over time, and how any changes in them affect climate. *Sort missions by clicking Launch Date, A-Z, or PHASE column headers. ACRIMSAT is the latest in a series of long-term solar-monitoring missions, utilizing the proven Active Cavity Radiometer Irradiance Monitor III (ACRIM III) instrument. This mission is part of SMD's Earth Systematic Missions program. The National Polar-orbiting Operational Environmental Satellite System (NPOESS) is a satellite system used to monitor global environmental conditions, and collect and disseminate data related to weather, atmosphere, oceans, land and near-space environment. This mission is part of the GOES/POES program. NPP is a joint mission to extend key measurements in support of long term monitoring of climate trends and of global biological productivity. This mission is part of SMD's Earth Systematic Missions program. @1. I don’t suspect it matters to you (since you possibly believe that all academic scientists are in on this enormous scam, right Berthold), but nevertheless, I will point out to you that James Hansen had nothing to do with the work I described in this post. The scientists who did this work are listed along with the abstract. All of your abstract are from Universities and government funded research grants -will they bite the hand that feed them? To sentence one: No I don’t believe that all academic scientists are in on this enormous scam. I am glad you admit that this is an “enormous scam”. I have gotten my opinions from 12 years of high school , four years of a very reputable technical college, and two year of post graduate work for a Masters degree in Sanitary Engineering – all with well qualified academic scientists. Since then I’ve had 47+ years of working with college professors at different levels including many PhD’s sometime they thought more of their degrees and sometime they were very realistic and recognized that others can have as much insight as themselves or more depending on the area of knowledge. I have had the opportunity and privilege of learning from sewer installers, plumbers, carpenters, and floor sweepers, but in the area of the Hoax of Mann-made global warming I have read the works of Fourier, Tyndall, and Arrhenius, they only suggested that the “greenhouse effect” might exist. Arrhenius developed an elaborate table of values of CO2 concentrations and possible atmospheric temperatures- he never developed a method of testing the Hypotheses. Before Arrhenius, Tyndall did some experimental work but the last part of his work was a sentence that his work was not complete and more research was needed. The work of Arrhenius was in 1896. In 1909 R.W. Wood, a professor of Physics and Optics at John Hopkins (from 1901 to 1955 a friend of Einstein, Max Plank, and I believe of Niels Bohr), published his experimental work that showed that the old believe in what causes the True “greenhouse effect” is confined space heating. To use the term “greenhouse gas effect” is stupid and used by “climatologists” because it induces panic. Obviously R.W.Wood was an academic scientist for 54 year. You should look up the biography of R.W. Wood and learn what a real scientist does to prove things by the “scientific method.” They do experiments not guess what was the effect that cause million year old ice cores or tree rings to be 1/33 inch wide various 1/5 inch wide. (insuto causes have to be calibrated an impossile task to do with any level of reliablity in this case). There is very poor record of what was the rainfall, snowfall, intensity of the sun, what was the cloud cover, what was the wind velocity, was there a “jet stream”, etc. Ponder the Maunder (started by a 17 year old girl that examined the real temperature data and reasoned that the temperature changes were all natural – before climategate proved that supposed “climate scientists like Hansen, Phil Jones, Michael Mann and many others have been Mann-ipulating the data. I have read such junk science web-site like “Skeptic Science” by John Cook and others. I have read Judy Curry before she switched to the real side although she has a way to go. Her “Climate ETC” is just a story book; it has no scientific value. The most dangerous supposed “scientists are arrogant “climatologists” that cannot understand that “climate is the results of thousands of weather days end to end at only one location and man cannot control the weather. I have been learning from real scientists like Dr. Charles Anderson, Greenhouse Gas Hypothesis Violates Fundamentals of Physics” by Dipl-Ing Heinz Thieme, Gerlich and Tscheuschner, Alan Siddons, Brian Sussman, Freeman Dyson, Alan Carlin of US EPA and many others. I know that Dr. Ed will be addressing the most dangerous part of this Hoax of Mann-made global warming after January 5, 2011, that is the possible lose of liberty and freedom at the hands of political tyrants using the “Big lie” that CO2 is the Sky Dragon. Your grandchildren and everyone's children ,grandchildren, great grandchildrens' freedom and liberty are in danger. Nor do they, as "sceptics" do (in this case Steve Goddard), cherry pick the weather on a particular day (in this case Dec 7th) and ignore what is happening overall. For those who do not follow the links, Steve Goddard has claimed this to be the coldest year in the arctic since 2004 based on a single fluctuation in the temperature graph, which immediately reversed itself, a reversal associated with a highly unusual reduction in arctic sea ice extent in December. I have seen more than enough of both sides of the issue call a hot or cold year or a flood or drought as proof of their position, including many climatologists. I also have seen politicians, and the news media, and many academics, make a lot of stupid comment on how AGW is causing everything from more prostitution to death of polar bears (which have mostly been increasing in number). Many on both sides make stupid statements, and I don't defend or object to any particular one (that I consider stupid), as I don't bother to find the detail on that nonsense worth pursuing. You seem to imply it is the skeptic that are more off base, but I consider myself reasonable and fair, and I find far more the supporters of CAGW as the main "cherry pickers" and people that state the ridiculous. I happen to agree that Berthold seems unwilling to accept the basic concept of atmospheric greenhouse gases, but many (but not all) of his other comment are partially to basically correct. The fact that he seems to come on so strong may be frustration mainly due to lack of reasoned response of many other supporters of CAGW. I personally would include you and scienceofdoom, and also Dr. Eric, as some of the people on the side of CAGW that I do respect but disagree with on some issues. Your comment on Steve Goddard brings to mind the formal comments from NASA, NOAA and many other organizations that made far more ridiculous statements on melting ice, heat waves, rising sea level, storm frequency, heat storage in the ocean, etc. which didn't pan out. I particularly love the no more snow projections for England. It's called the "seesaw effect", Tom. You should read up on it. Let us all hope that at half-a-precession cycle old, this also 400kya eccentricity minimum extreme interglacial lasts as long as Loutre and Berger (2003) suggest it might. Another 50kya. For perspective consider that only 10kya, we graduated from cave paintings to the written word, during this interglacial…..
About half that long ago we discovered bronze! Go ahead. Strip the CO2 "security blanket" from the late Holocene atmosphere. Preclude that 50kya L&B "long interglacial". And hope MIS-11 repeats. Sans the extreme cold excursions between thermal maxima, of course. We will modulate this out, rest assured. But are we really that self-assured? Have we really got it right? Well, we (meaning H. sapiens) was certainly there during the Eemian. And climate got quite crabby over a hundred thousand years before we could write about it. Before dropping off into the Wisconsin glacial. Something like 6-20 meters above AMSL! End, recent, extreme, post MPT interglacial noise? And our signal, again, will be????? The change in sea ice in December is a blip. I don't care if Steve Goddard cherry picked to present data, I don't expect you to cherry pick to criticize. Steve has made some good comments, and will make errors. This is a continually changing situation. I think Steve would be the first to be willing to be corrected as more data comes in. He is open in what he claims and how he does it, so he expects to be corrected, not criticized.